Oh my gosh, sometimes, I amaze myself in the kitchen. I was trying to make myself lunch using random ingredients in the fridge but not using them all, because I still need some to make dinner for two later on. In the end, I decided to try something like an Aparna Special, which is like a quesadilla but not very Mexican. 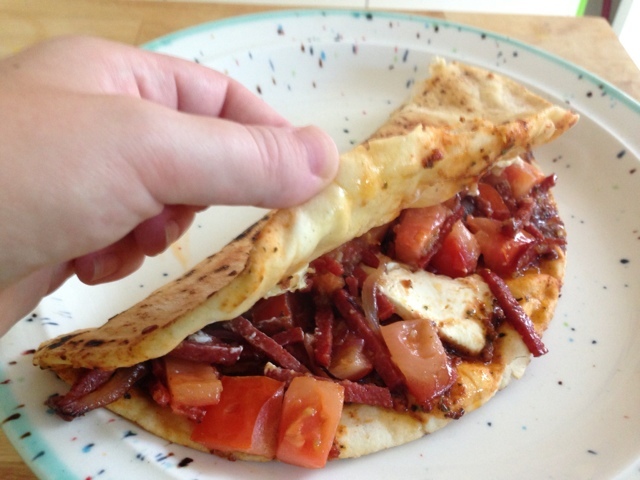 This one was pretty Italian, with pizza sauce, Italian herbs, salami, a week-old half tomato, onion and lots o' garlic on a piece of flat bread. Oh, and leftover Neufchâtel cheese from when Hugh made Heston Blumenthal's mac 'n' cheese the other night (plus kangaroo pepperoni; awesome!) I wasn't sure how all these random ingredients would work out together. I needn't have worried. That was the most satisfying and delicious lunch I've had in a while! Try it. Fry a bit of onion in olive oil until browned (mine was red onion). Add salami sliced into slivers and fry for a minute. Add lots o' minced garlic (I used a garlic press and five cloves). Fry another minute or so, then add the tomato and fry for a short while. Optional: spread herbed pizza sauce on half of the flat bread. Cut three slices of Neufchâtel and add to flat bread. Tip the contents of your frying pan into the flat bread, the put the whole thing back in the pan (it's good if there's still a bit of oil left in the pan). Fry until cheese is slightly melty and bread is crispy delicious. You are done! Good job, you.